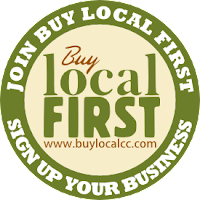 The Buy Local First campaign was launched in November 2008 with one goal in mind: to help people make a difference in Clinton County. The reason we started the Buy Local First campaign is because we realized that most people didn't think about the fact that one of the biggest differences they can make is supporting our local businesses. Buying local invests in Clinton County, builds our community, and makes us unique. 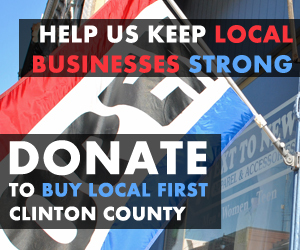 Buy Local First is a coalition of business owners, local officials, and concerned citizens that are pulling together energy and ideas to make our local businesses the first destinations for Clinton County's residents. So the next time you are looking for a new novel, or you decide to eat out, consider making a difference by choosing to buy local, stay local, eat local, and be local. The Buy Local First campaign started with window decals and awareness, but it is ready to grow. Our goal is to be a clearinghouse for residents and locals businesses to come together to have a conversation and build energy around supporting our local economy. In the process, we'll be doing all we can to entice you to buy local through community events, campaigns, and discount specials.